Chicago Bicycle Accident Lawyer | Illinois Bicycle Lawyers at Keating Law Offices: Why Do So Many Bicyclists Fracture Their Collarbone In An Accident or Crash? Why Do So Many Bicyclists Fracture Their Collarbone In An Accident or Crash? The Illinois Bicycle Attorneys at Keating Law Offices have seen first hand that one of the most common injuries for bicyclists hurt in an accident or crash is a fractured collarbone. Even 7-time Tour de France champion Lance Armstrong suffered a broken collarbone which required surgery. The collarbone, or clavicle, is probably the most susceptible bone on the body of a cyclist but not for the reason most people think. Many cyclists break their collarbone not by the bone itself hitting the pavement, but from the fall of their bike. When a cyclist is thrown from a bicycle, their immediate and instinctive reaction is to put their hands out to break their fall. However, when their hands hit the pavement the jarring force causes the collarbone to buckle under pressure. This event is known as the "mechanism of injury." An Australian doctor who deals primarily with cyclist injuries, Dr. Dominic Briscomb, says that 95% of collarbone injuries can be diagnosed by touch. Most cyclists can feel a noticeable bump in the area and the arm on the side of injury can go numb. Should you feel a bump or sharp pain, you should IMMEDIATELY go to the hospital. Most minor collarbone breaks can be treated by simply placing your arm in a sling for 3-6 weeks, however more serious collarbone breaks can require surgery. The most common surgery is an open reduction - internal fixation surgery (ORIF) where a surgical plate and screws are used to secure the fracture. Finally, after the break has healed, physical therapy is a required. It is important to attempt to regain full range of motion after a collarbone injury and physical therapy is a valuable tool to not only get back on the road, but to get 100% physically. Most avid cyclists will want to get back on the road as soon as possible following a collarbone break, but these cyclists should proceed with caution and wait until they have clearance from their treating physician. Keating Law Offices currently represents numerous cyclists who have suffered broken collarbones after being struck by motor vehicles. 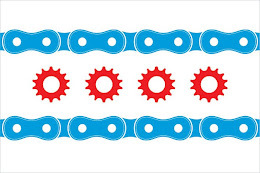 If you have any questions regarding this post or an issue involving Illinois personal injury law, please contact Illinois Bicycle Attorney Mike Keating at 312-208-7702 or MKeating@KeatingLegal.com 24 hours a day, 7 days a week. All e-mails and phone calls are returned promptly. All initial consultations are confidential and free.